Unless you are one of the lucky few that get to enjoy year round warm weather and pool time, chances are you’ll need to buy a cover for your pool. Unfortunately it isn’t nearly as straightforward as you would hope; there are quite a few questions to answer and choices to be made. Here at Pool Supply Unlimited we want to make that process as painless as possible. 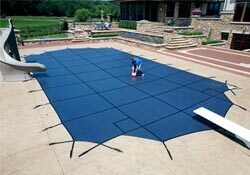 When you go shopping for a pool cover, here are the major things you’ll want to consider. Should I buy a safety cover or a winter cover? This choice is dependent on the pool owners’ needs and preferences. Winter covers are much less expensive than Safety Covers. Very easy to install – simply laying the cover over the pool and placing water tubes around the perimeter is as complicated as it gets. Typically requires professional installation because safety covers attach using posts (hooks) that are drilled into the concrete. Because Safety Covers float a larger price tag and are more securely attached to the pool deck they are, well, safer. This should be a consideration for all home owners, and especially those with children. Aesthetics – Many people prefer a safety cover because they like the way it looks over a winter cover. This may seem silly, but consider you’ll have to look at the pool cover at least half of the year. Is a mesh cover or solid cover better? There are benefits to both solid and mesh. 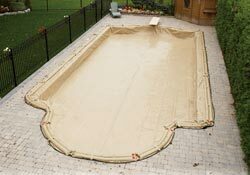 The main advantage of solid covers is that they keep water out of the pool. During the fall and winter leaves, dirt and debris will collect on the cover. This causes any water from rain and snow to become dirty. If you have a mesh cover, this dirty water is going into the pool – with a solid cover this is prevented. On the same note, most solid covers do not drain water from rain or snowfall. In such cases the water that collects on the surface of a solid cover must be pumped off the cover. This can be time consuming and pumps can be costly. To combat this problem, our solid Safety Covers feature a center drain that catches the finest dirt and debris, but still allows the cover to drain. This eliminates the hassle of pumping off your cover each spring. In addition to blocking water, solid covers don’t allow light to pass through. Our Arctic Armor solid covers are constructed of an extremely tight weave fabric that blocks sunlight. This is important because as it starts to warm up in the spring and the pool water warms up, algae will grow if the water receives sunlight. All mesh covers eliminate the need for pumping by allowing water to pass through, however most mesh covers also allow a significant amount of dirt to pass through as well. This leaves you with a huge mess to clean up in the spring. Both our safety and winter mesh covers are constructed using a super tight weave that allows water to pass through, but filters out the finest debris, lessening the task of pool cleaning in the spring. Much lighter than Solid Covers – This means mesh covers can usually be taken on and off by one person, whereas a solid cover can require 2+ people. 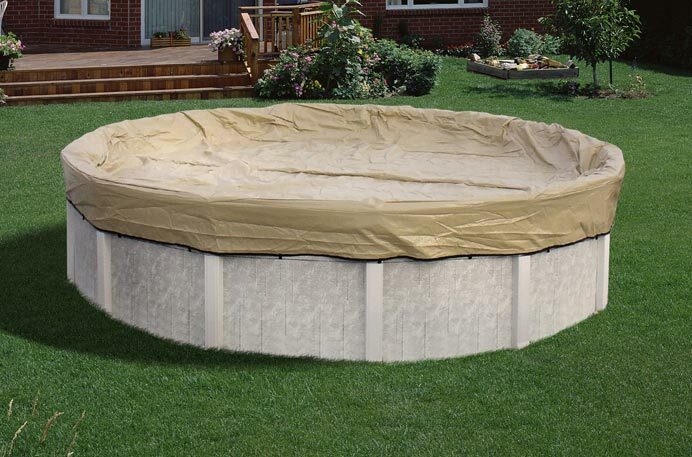 What cover should I buy for an above ground pool? This makes your decision a bit easier – Safety covers are not made for traditional above ground pools, so you just need to choose which solid or mesh above ground winter cover is right for your needs. Our Arctic Armor above ground solid covers feature super-strong woven material and a big 4-foot overlap for better wear. There are quite a few choices ranging from the economical cover with an 8-year warranty, to the premium Gorilla cover that feature a 20-year warranty. 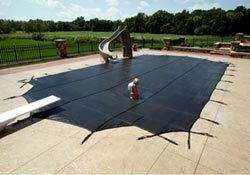 The majority of the above ground pool selection is solid covers, with one 8-year warranty mesh option. We specialize in custom Safety Covers! Click Here for our custom cover measuring and order form. Simply complete the form and fax in. Also, always feel free to call and speak with one of our pool cover specialist. The Commercial Mesh Cover with a 25-year warranty might be the best bet for your pool. This 25-yaer Safety Cover is constructed of industrial-grade mesh that will withstand heavier snow loads, extreme wind, and longer exposure to the sun. This cover is guaranteed to last two times longer than a standard mesh cover. *“Unintentional Drowning: Get the Facts.” Centers for Disease Control and Prevention.